It’s Wednesday night and I am anxious to see what this week’s recipe will be. 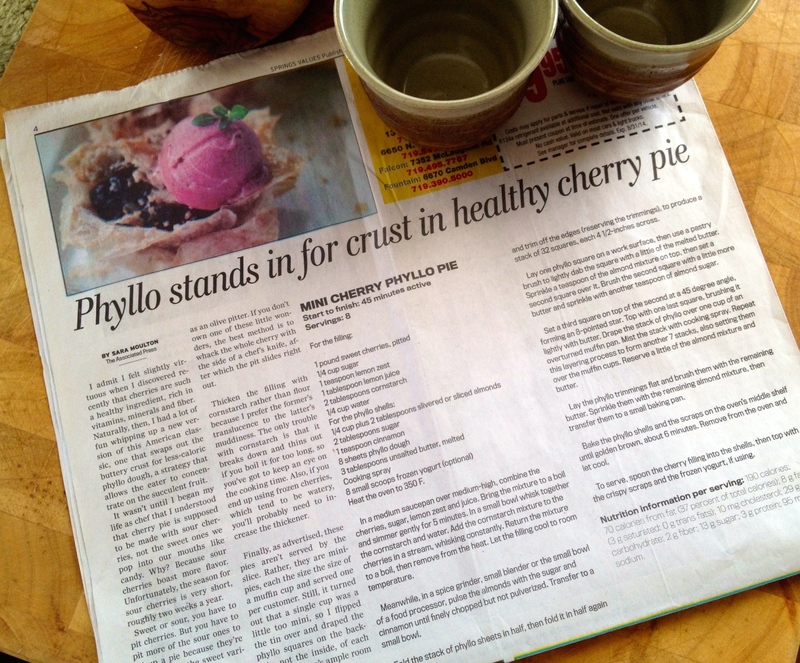 But I did make the Mini Cherry Phyllo Pie(s) and wanted to share the recipe. 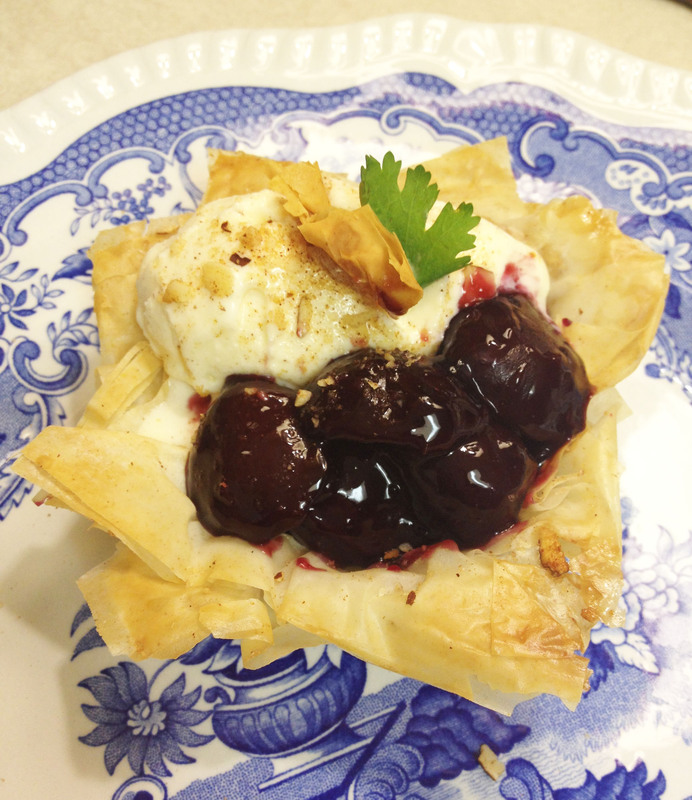 I headed to the market and picked up a box of Athena Phyllo dough and one pound of cherries and headed home. Good timing, as cherries are $1.99 a pound right now in Colorado Springs. I put on my latex gloves began pitting the cherries by hand, without my handy cherry pitter, as it had broken last summer and I have yet to replace it. But splitting and pitting a pound of cherries only took me 11 minutes! Yes, I timed it. Difficulty: If you are a perfectionist, this is not a recipe for you, or beginners. Phyllo dough is tough to work with and you must work fast as the dough dries out quickly. The recipe doesn’t mention this, nor does it mention to place a damp paper or cloth towel over the dough when you not working with it. Also, since most of us do not make phyllo dough, we do not have control over its quality. Even thought I was very careful rolling out the dough, it still had large cracks in it even when I let it sit for few minutes at room temperature. Timely: Even though the dough is pre-made, it takes patients to separate very thin layers of dough and place them over the inside-down cupcake pan. Reality of Recipe: This is low-calorie recipe and I love that part about it, but the reality is, that if you want your dough to be brown and pretty, you must use more butter ALL over the phyllo dough squares. But this makes for a fattier and higher calorie pastry than the recipe implies. Make it Better: Cutting the dough without folding it would have been easier and less breakage of the dough sheets. Fit Filling: The filling was very easy to make and was very tasty. Though I would add almond extract and cinnamon to the filling next time. Overall: Okay. I’d make this recipe again, but with the changes previously mentioned. Low-Calorie Cherry Pie made with a phyllo dough crust to cut down on fat and added calories. In a medium saucepan over medium-high heat, combine the cherries, sugar , lemon zest and juice. Bring the mixture to a boil and simmer gently for 5 minutes. In a small bowl whisk together the cornstarch and water. Add the cornstarch mixture to the cherries in a stream, whisking constantly. Return the cherry and cornstarch mixture to a boil, then remove from the heat. Let the filling cool to room temperature. While the filling cools, pulse the almonds in a food processor with the sugar and the cinnamon until finely chopped, but not pulverized. Transfer to a bowl. Fold the stack of phyllo dough sheets in half, then fold it in half again and trim off the edges (reserving the trimmings). There should be a stack of 32 squares at 4-1/2 inches across. Lay one phyllo square on the work surface, then use a pastry brush to lightly brush the square with melted butter. Then, sprinkle a teaspoon of the almond mixture on the top and place a second square over it. Brush the second square with more butter and sprinkle with another teaspoon of almond sugar. Set the third square on top of the second at a 45 degree angle, forming an 8-pointed star. Top with one last square, brushing it lightly with butter. Drape the stack of phyllo over one cup of an overturned muffin pan. Mist with phyllo stack with cooking spray. Repeat the layering process to form another 7 stacks, also setting them over the remaining muffing cups. Reserve a little of the almond mixture and butter. Lay the phyllo trimmings flat and brush them with the remaining butter. Sprinkle them with the remaining almond mixture, then transfer them to a small baking pan. Bake the phyllo shells and the scraps on the over's middle shelf util golden brown, about 6-8 minutes. Remove from the oven and let cool. Spoon ht e cherry filling in the shells, then top with the crispy scraps and frozen yogurt, if desired. 190 calories, 70 calories fro fat (37% of total calories); 8 grams of fat (3 gram saturated: 0 grams trans fats); 10 mg cholesterol; 29 grams carbohydrate; 2 grams fiber; 13 grams protein; 95 mg sodium.